As the new recruit to League of Light, you’ve been tasked with investigating the recent kidnappings in a remote village. People report seeing a huge, winged creature flying through the night. But as you arrive you’re told a horrifying story of a Dark Lord and his reign of terror over the lands and how he was sealed away. 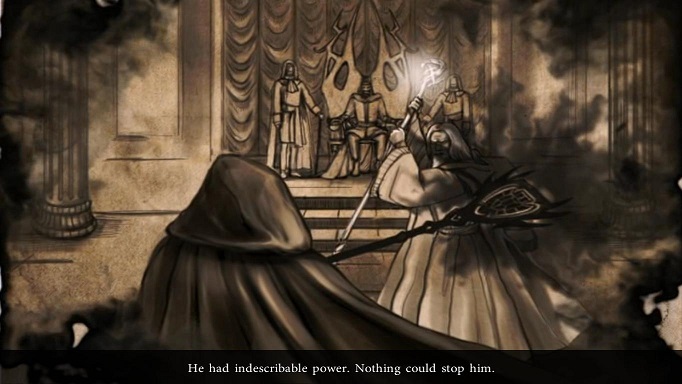 It doesn’t take long for things to go from bad to worse when you unwittingly set the Dark Lord’s revival in motion, having been used by the forces of darkness. Now, with time running out, it’s up to you to set things right again. My first exposure to Mariaglorum’s games was actually Mystery of the Ancients – Curse of the Black Water, though I fail to remember if I beta tested the game or merely played the demo. Either way, I liked that game quite a bit so I went back to play the first Mystery of the Ancients, Lockwood Manor, but experienced a glitch that made it impossible to progress. And that’s kind of where I stopped, to be honest. But this summer I was overwhelmed by all the sequels from the same companies so I craved something different, something I hadn’t tried before so I decided to give League of Light a spin since it’s been in my library for years but remained unplayed. And in doing so I also went back to play the two first Mystery of the Ancients to see if it was just a fluke that Dark Omens was so good. It was not. Dark Omens starts off fairly routine with a “save the fair maidens”-plot and then continues rather complacently with a “resurrecting big bad evil” story all set in a mostly blue environment. From the outset, there was really nothing to draw me in or impress me but as I continued playing the game I discovered a more interesting world than I first thought. Though relying on classic tropes, Mariaglorum also set out to create something wholly unique and fresh, taking old and tried stories but freshening them up a bit with new material. Once you run into griffins and soot bunnies and poltergeist the game truly comes alive and starts pulling you into its world. A world filled to the brim with exciting creatures and lore and it almost transforms the whole game. And as my outlook on the game became more positive, I started to enjoy everything a bit more. 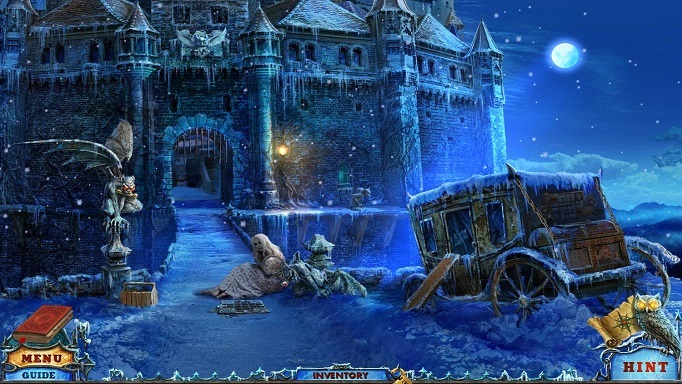 The hidden object scenes, the puzzles, the environment, even the color blue, which was very pervasive, started to look appealing… started but didn’t quite finish. And that’s really my biggest complaint when it comes to the game, the color blue. I can sort of accept it when you’re outside in a winter landscape in the night. Sort of, it’s still a bit lazy if you ask me but it makes a kind of sense. But once you get inside the castle I expect the dominant colors to change. And to some degree they do but you still have a lot of blue permeating the art even where you don’t necessarily think there should be any blue. One of the advantages of blue, however, is that it really makes the other colors pop a lot more. The purples, reds and greens really stand out against the background which, when done right, creates really enjoyable scenery. So it’s less that I don’t like the color blue but more that I don’t think many games use it very well. Dark Omens is definitely on its way in this department but there are still scenes that really are just blue and dark and put me off. Sure, it might not for the average player who doesn’t play ten of these every month but that also gives me a unique perspective on the matter and I see trends that others necessarily don’t. It also bears mentioning that the game is a few years old by now, three to be exact, so the graphics aren’t necessarily as sharp as I’d like and the animations, especially for characters, are a bit of a joke. But since this was Mariaglorum’s third game, from what I can tell, I’m willing to cut them quite a bit of slack on this. 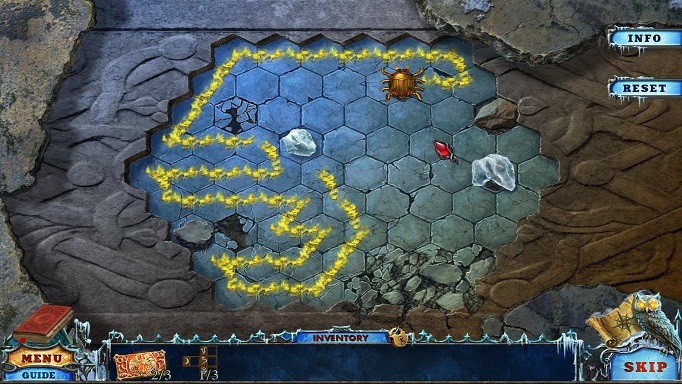 Still, if you’re looking for the latest in terms of graphics in HOPA, this definitely isn’t for you. But as I’ve often pointed out, graphics and story rarely make a game worthwhile if the rest is bad. 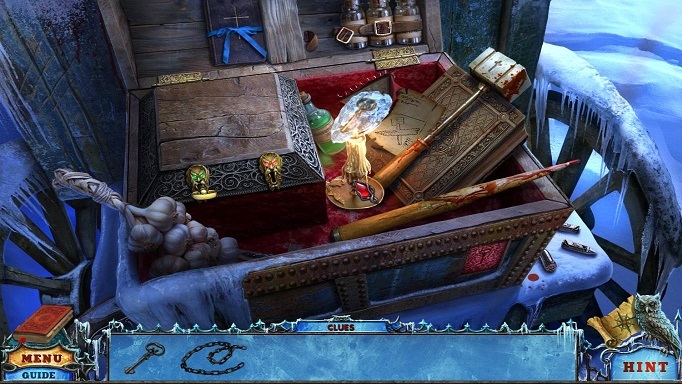 And Dark Omens definitely clocks in above the average here, featuring some quite enjoyable puzzles and skillfully crafted hidden object scenes with some variety. While nothing is particularly groundbreaking, not everything has to be and what is here is instead given more detail and finish. Some additional difficulty wouldn’t have gone amiss, that’s for sure, but when do I not complain about that? Even then I have to admit that some puzzles did give me a significant run for my money and some I simply outright skipped because they boggled my mind. Few puzzles were susceptible to brute force, where you simply try randomly over and over again until it’s solved, and even the ones that were susceptible could usually be completed much faster with just an extra bit of thought. So while I would’ve liked to see a bit more variety and creativity in the puzzles, what is there is actually quite a lot of fun for the most part (except those damn puzzles I simply cannot do… like, at all… damn them). 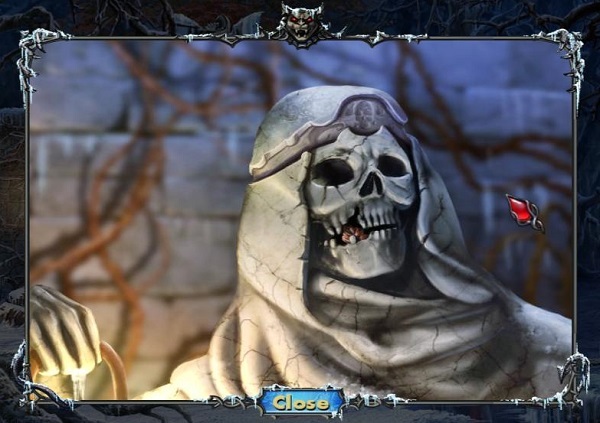 They definitely did well with the hidden object scenes, though, adding a bit of variety to the scenes by including silhouettes and fully interactive chain-scenes as well as the classic list scenes. While Eipix are still the unchallenged experts in this regard, having so many different kinds of hidden object scenes, there’s enough variety here to keep me entertained throughout. 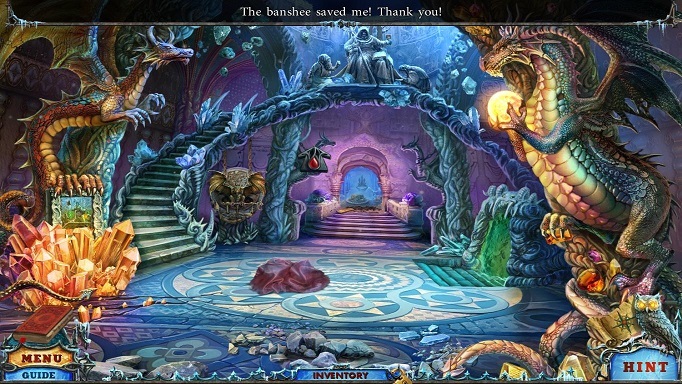 Though HOPA in general tend to get very hidden object scene-heavy towards the end, Dark Omens paced itself very well and kept the variety up and new puzzles kept coming regularly. So while huge variety is never wrong, you don’t need to stretch yourself silly over it either as long as what you have stands up. But what really got me was the world building. I’m hugely into world building and I love just seeing what exists in these different worlds that I come across. And here Mariaglorum set out to create a fantastical world and succeeded very well. As you run across different creatures and entities, everything from the hydra to griffons to poltergeist, there’s always a little entry somewhere that explains what these creatures are, where they belong in the world and what their weaknesses are. It’s one of the first times that I missed something in a HOPA and thought to myself “It’d be worth playing it again just to find those last things.” Simply because they actually help me understand the world better. And it’s not hurt by the fact that everything was so disturbingly cute. 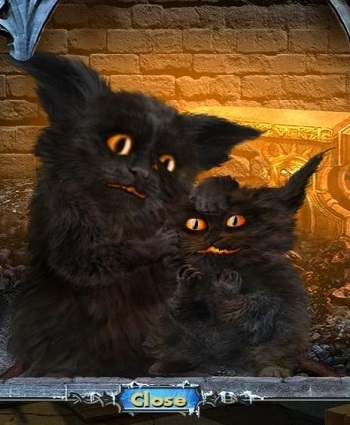 What I call soot bunnies (I forget their in-game name but they’re black and live in fireplaces) are so crushingly cute and the little griffon baby is soooooo freakin’ adorable. It all very much felt like old stories that I’d used to read as a kid with lots of pictures and a young girl coming across all these magical things during a magical journey. And for once, the concept art was absolutely amazing. Normally I don’t look much at the extra stuff but this time I even saved a lot of it and now having them part of my changing desktop, they’re that worthwhile. I mean, how can I not fall in love with that? 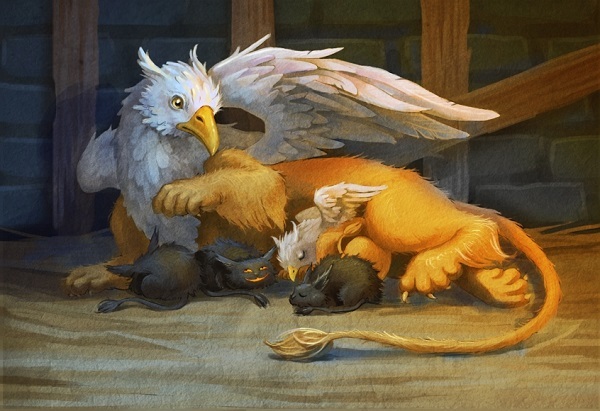 And the concept art is full of this stuff and it kind of makes me want them to make a sequel with only the creatures ’cause they were amazing. And I liked the bonus chapter as well, surprisingly enough. Normally I don’t, I don’t really like the practice and I’m happy to see that many companies when migrating to Steam only have one version. This will allow them to make sure everyone gets the whole story whereas now you’re either paying for something entirely unnecessary or people not buying the collector’s edition miss out on crucial information. This game is one of the latter cases as the bonus chapter details what happens after main game “ending”. And is the real ending, in a way. But pick it up on Steam, where it was recently released, and you don’t need to worry about any editions as it only comes in form. This is good though I hope the pricing starts dropping eventually but I guess, as long as Big Fish are publishers, that’s not happening. Still, woohoo, there’s a lot of HOPA on Steam now and good ones too! Gonna be interesting to see what happens on this front. So Dark Omens is a really good way for Mariaglorum to launch themselves onto Steam and it’s a game that’s going straight on my list of “You wanna try HOPA? Start here!” It’s cute, it’s fun and I cannot wait to see what they did with the sequels. And that’s how you build a franchise. I mean, hell, there’s a friggin’ dragon skeleton in one room… I wanna know more about that one, dammit! For more screenshots from the game, check below. If you want to purchase the game, I recommend you buy it through Steam here or use the client.